“Just Skin” was selected for the third volume of the critically acclaimed Uno Kudo, a literary and arts publication that features significant new words and art from a diverse array of contributors, presented in expressive and luscious layouts. This volume includes literature from Kristine Ong Muslim, Marvin Waldman, Meg Tuite, and Heather Dorn, as well as art from Ramona Zordini, Victor Castillo, Deedee Cheriel, Jeremy Geddes, and MANDEM. 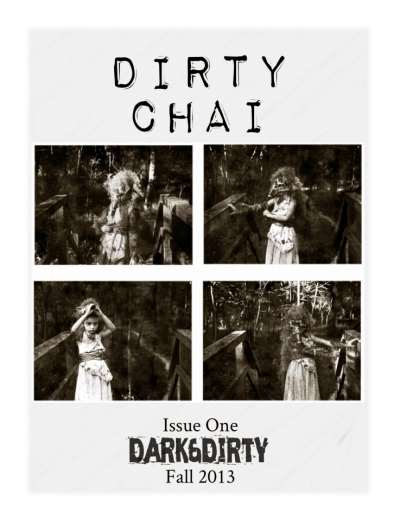 “Doll” (a collection of images from MANDEM’s short film of the same name) is featured on the cover of the Fall, 2013 issue of Dirty Chai, a quarterly literary publication that features a wide variety of fiction, poetry, non-fiction/essay, and visual art. Dirty Chai aims to publish writers who transcend their genre. The Fall issue of Dirty Chai features writing from award-winning authors Allie Marini Batts, Dr. Mel Waldman, Jenean McBrearty, among many others. “The Washerwoman” is included in the fourth volume of Postscripts to Darkness, an Ottawa-based anthology of dark fiction and art that was founded by the award-winning Sean Moreland (University of Ottawa). MANDEM’s artwork was also featured in volume three of this anthology earlier this year. Earlier in 2013, MANDEM’s work appeared in 15 other publications, including the covers of 6 books and literary magazines. This autumn, MANDEM celebrated their 100th art publication.